Rachel Chisholm, curator at the Highland Folk Museum, had been very helpful with preparation for the visit, sending us a comprehensive print out of the collection in advance. With museum visits, it is always difficult to achieve seeing as much as one would like of the collection in a short visit because of the time required to process each artefact carefully. Rachel really supported us with this, allowing us to photo the baskets, and we saw and documented almost every basket we had hoped to. The museum has a very comprehensive collection of Highland and west coast baskets. What has become clear during our research for this project is that there is far less material available, either in museum collections or documented in archives, for baskets from the west and the Highlands, as opposed to from the east of Scotland, or the Northern Isles. This is not because baskets were not used in the west. 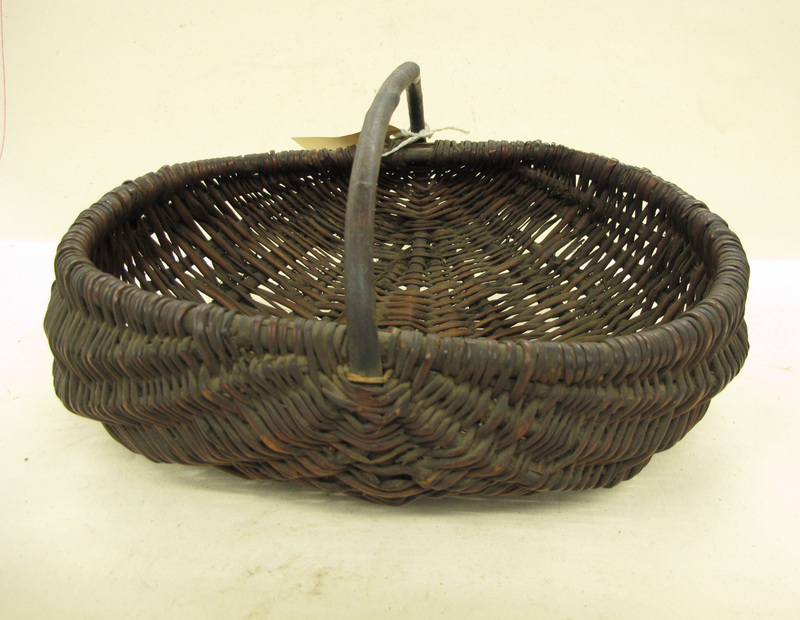 Far from it, they were a feature of almost all aspects of life, and basket use in crofting in these regions in many cases endured far longer than in fishing in the east or in Lowland agriculture. However, as Isobel Grant, who made this great collection, commented, she found that people from the Highlands and west coast were far less proud of their heritage than elsewhere. Indeed, she said that people simply did not think she would want their artefacts for her collection. This being said, she still managed to acquire many important and representative examples of baskets from these regions during her collecting of ‘all manner of homely things’ for the Highland Folk Museum. Thus, there were many straw and bent grass coiled baskets, ciosans, formerly used as meal measures from the Uists and the west coast. From North Uist, also made from bent grass, were several beautifully constructed horse collars, revealing the effort which went in to making these everyday artefacts used for working with animals. There were willow bannock baskets from across the Highlands, willow frame baskets, probably made by Travellers from Wester Ross, straw bee skeps of many shapes and sizes, several with caps, oval willow mudags for holding fleece to be spun, and a range of pot scrubbers and brushes made from heather, bent grass and even one from hair moss. There were several excellent peat creels, including one made from heather from Badenoch, another from rattan from North Uist, and an example from Skye, very fortuitous, since so few examples are to be seen on Skye itself. 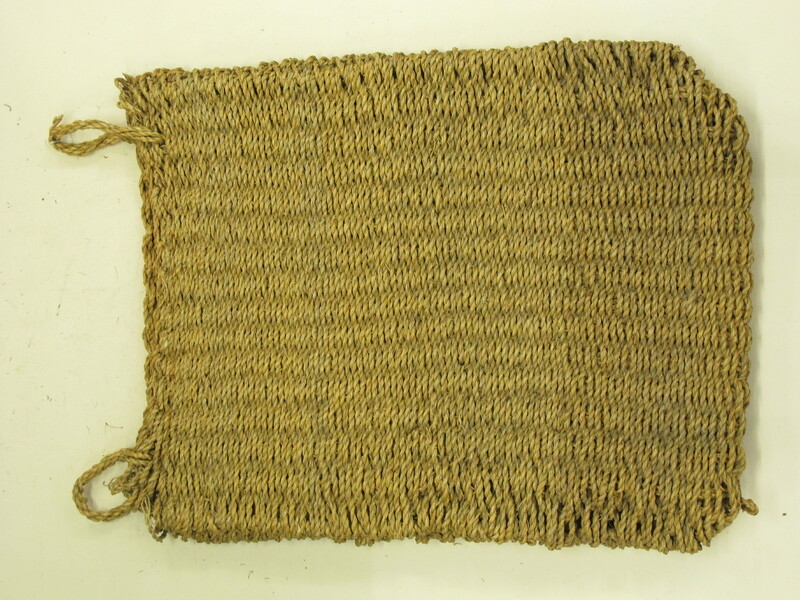 One of the most significant pieces was a bent grass grain sack from South Uist. 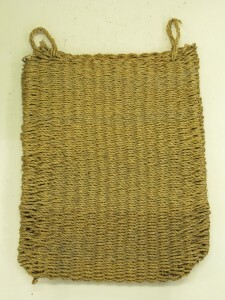 This woven sack, made from the same technique as woven saddle pads, is the only other example, aside from the one collected by Erskine Beveridge for the National Museum of Scotland, of a basket known in Gaelic as plata mhuillin, or plata shil, and used to protect grain from splashing by salt water while transporting it by sea to the mill. We were also allowed to visit the furniture store in the museum, where we saw how basketwork from willow, rush and straw was used in furniture, made at a time when it would have been cheaper to make chair backs and seating from locally available plant materials rather than imported stuffs, or even wood.